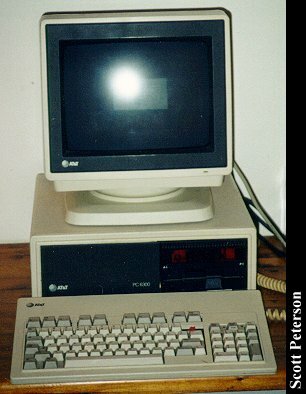 This is an AT&T PC 6300, circa 1986; I believe it was one of AT&T's earliest entries into the personal computer field, and didn't last long. Why I don't know, but as least one reason I can think is that compared to the IBM AT it wasn't much to write home about. 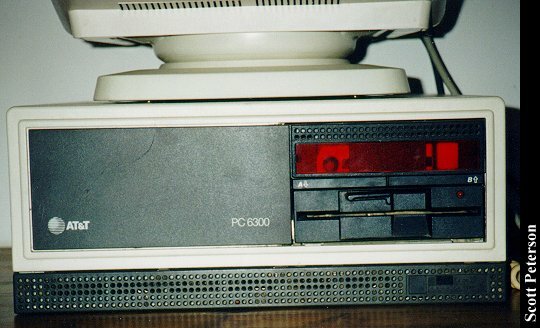 It's a nondescript 8086 (AMD, not Intel) with a 360K floppy and 10 Meg hard drive. 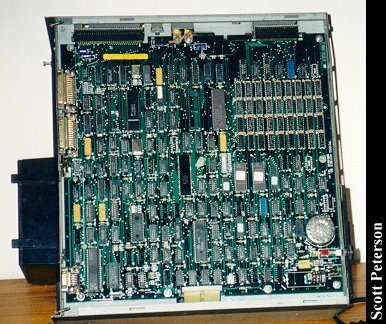 This machine originally had 256K of RAM, augmented to 640K by a memory board. Very strangely, most of this computer was actually made in Italy by Olivetti, including the hard drive. I can only think that AT&T did this as a cost cutting measure, to keep the overall cost per unit down. 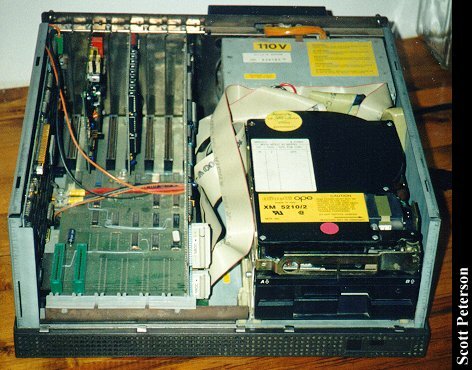 The PC 6300 is also a rather poorly done design, the "case", split in two, with a large upper case containing the ISA bus and drives, while a lower case contains the motherboard. 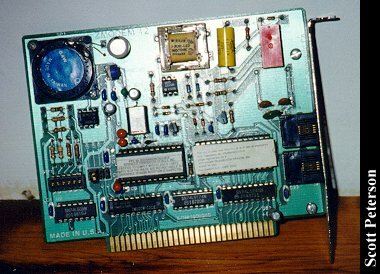 The two cases share in common the CGA video card, so upgrading the video card wouidn't have been likely for most users. This one has MS-DOS 3.30 on it, and some ancient word processing and mortgage assessment software. I loaded Windows 1.03, as it somehow seems fitting. The keyboard is absolutely horrible, with keys having to be hit hard to work, but that may not be the machine's fault as the previous owner reputedly typed by stabbing the keys, and one key is missing. This one was given to me as a semi-dead computer along with a dead Xerox computer, both coming from different places. I was puzzled to notice they had similar cooling fans on the power supply, and when I got them running I saw the familiar AT&T startup and realized they were practically the same computer, The Xerox was a PC 6400, and slightly newer. It differed from the AT&T in having a metal gray case, NEC V30 processor, Seagate hard drive, and a different keyboard. As the Xerox was in far worse shape, I cannibalized it to complete this one. I can only guess that AT&T licensed the 6300 to Xerox so they could use their name on it. Screen shot. Yes it's color, but that's all. 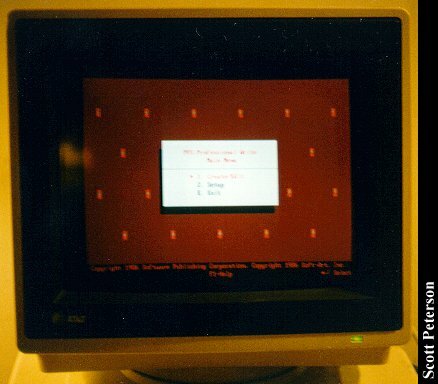 Blurry, but a shot of Windows 1.03. Notice it's in black and white, as I can"t get Windows to run color on it. Close up of case, showing a mix of styling that's best described as late seventies meets Italian fashion. The red lens is a cover over the Olivetti drive (it sounds like the return carriage on an electric typewriter) to let you see the function lights. Blurry, but back view showing a rather standard layout except for the protruding fan. View of upper case, showing numerous factory jumper vares and the heavy duty power cables. The video card that connects all the pieces is on the left. View of lower case. Good rule of thumb- if it's a big motherboard covered in chips, it's probably an AT&T. Sockets connecting to the video card are at top, and notice how the fan sticks out in back. 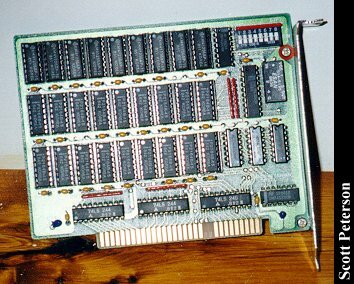 Close-up of 384K memory board. 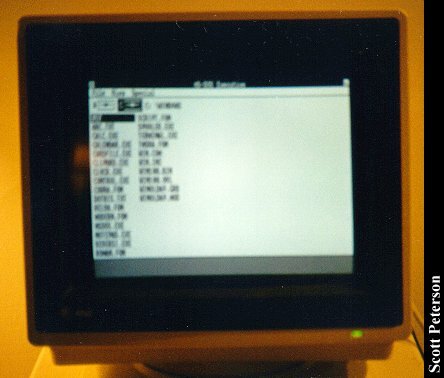 Close-up of "Z modem," that I found installed, but no communications software was on the computer. Click here to view all comments for the AT&T PC 6300 and to leave your own. Click here to view comments about other AT&T computers.